What Are Some Activities I Should Avoid While Pregnant? A pregnant woman may not be able to continue some of her normal physical activities, especially when she is into advanced stages of pregnancy. A pregnant woman may not be able to continue some of her normal physical activities, especially when she is into advanced stages of pregnancy. This is mainly to avoid harm to the baby in the womb and to the mother-to-be. The American College of Obstetricians and Gynecologists (ACOG) say that any activity performed above 6000 feet has to be curtailed during pregnancy, as oxygen level is less and can cause problems for both the prospective mother and for the fetus. The body undergoes immense physiological changes while you are pregnant and certain lifestyle changes are essential to keep you and your baby safe. What physical activities must be avoided during pregnancy? Contact sports like basketball, hockey, and soccer, have to be avoided. Injury may occur while trying to pass on the ball and chances of falling or getting hit are high. Bicycling is a strict no-no, unless you are in the sport or have regular practice of bicycling before pregnancy. Once you shift into your third trimester it is best to stop cycling. The American College of Obstetrics and Gynecology recommends pregnant women to avoid lying on their back for long as it can decrease blood flow to the baby. They instead advise to lie on their sides and recommend many other standing and sitting exercises too. Each woman is different in terms of physiology and psychology; but exercising (within certain limits) is good for the developing baby. What type of physical activities help during pregnancy? 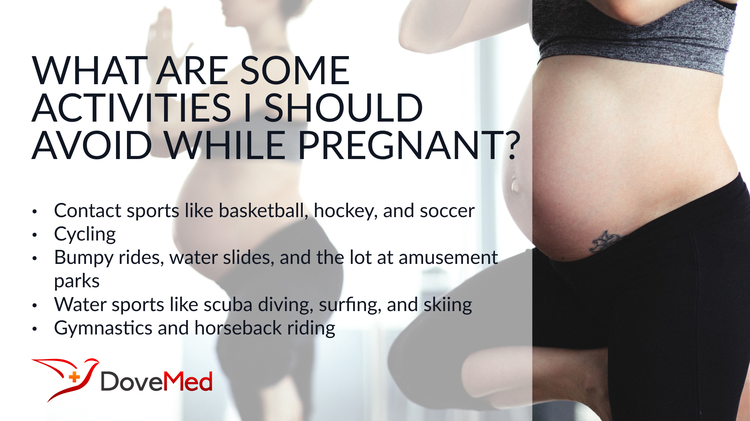 There are some activities to stay away from while you are pregnant. Do not overwork, but make sure you breathe deeper. 30 minutes of moderate exercise is suggested every day. Only your healthcare provider can suggest what is best for you. Do not undertake rigorous exercise while pregnant, but at the same time being a couch potato can also lead to pregnancy complications. Moderate exercise is suggested to keep the body fit for labor. Strengthening and flexibility exercise can prevent backaches, hip and joint pain. It can also reduce bloating and swelling that is common during the first trimester. Limited physical activity can make you feel energetic and keep your mood upbeat. Light cardiovascular activity can improve blood flow and keep your muscles stronger. Cardiovascular activities that are non-weight bearing, like swimming, cycling and walking can be carried out. Aerobic exercises are also low impact, but they should not be performed for a long time. Pregnant women must stop exercising when they experience signs of fatigue, shortness of breath, swelling, back pain, numbness, rapid heartbeat and nausea. Never exercise while you have vaginal bleeding or contractions. Women with chronic heart disease, blood clots, preterm rupture of membranes, hypertension, bleeding, thyroid disease, pulmonary disease, incompetent cervix and intrauterine growth retardation are advised to avoid many forms of exercise. Artal, R., & O'toole, M. (2003). Guidelines of the American College of Obstetricians and Gynecologists for exercise during pregnancy and the postpartum period. British journal of sports medicine, 37(1), 6-12. Barakat, R., Stirling, J. R., & Lucia, A. (2008). Does exercise training during pregnancy affect gestational age? A randomised, controlled trial. British Journal of Sports Medicine. Evenson, K. R., Barakat, R., Brown, W. J., Dargent-Molina, P., Haruna, M., Mikkelsen, E. M., ... & Yeo, S. (2014). Guidelines for physical activity during pregnancy: comparisons from around the world. American journal of lifestyle medicine, 8(2), 102-121.